6.83 points at 12 votes (rank 392). 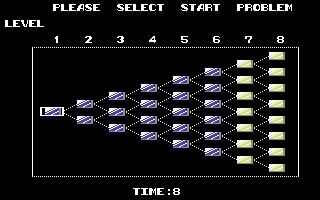 This logic game contains 144 levels. Some tasks are simple and other are devilishly tricky. The game principle of Puzznic is simple, but the game is hard to master. If at least two identical stones are strung together, they will dissolve. 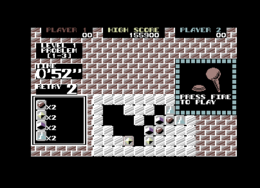 The task is seen as solved when all stones were cleared within the time limit. 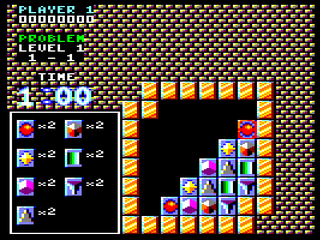 The starting level can be chosen freely between one and six. 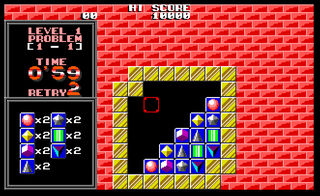 Then only an adjacent field of a higher level can be picked. The game can also be played by two players in turns. 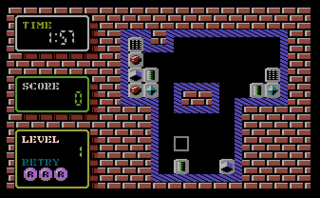 Simple 2D graphics, where always the whole level is visible. 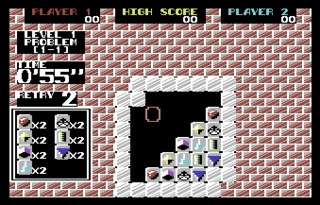 At the top the current score of both players and the highscore are shown. 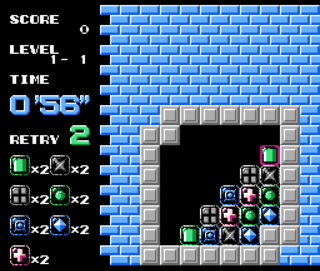 In the left area the current level, the time left, the number of retries and the number of stones left, are displayed. Music constantly accompanies the game. The game is paused with the key RUN/STOP . 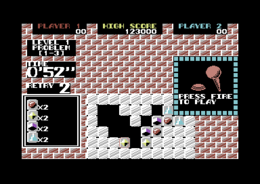 By pressing the key Space the options menu is called up. The game is continued with the fire button. With space the current level is restarted without setting back the timer. A falling brick can only dissolve when it has a fixed position. The faster a level is solved the more points you get. Nine credits can be used until the game is finally over. There are bonus points for a chain reaction, but also more time is used up. In the first stages you should place your attention towards those bricks of which there is in an uneven number. 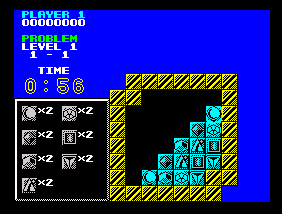 A "Retry" (2 x space) does only make sense if the level has gotten unsolvable and there is also still enough time left. Werner: "A simple but at the same time ingenious puzzle game. 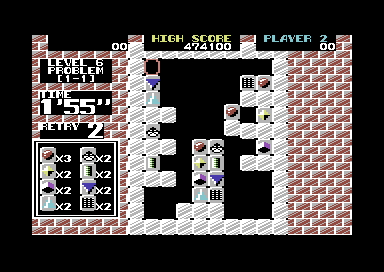 A small and therefore cleary arranged game area with especially tricky puzzles starting from about level 6. The graphics are only mediocre. But in a puzzle game this is acceptable. 9 points from me." 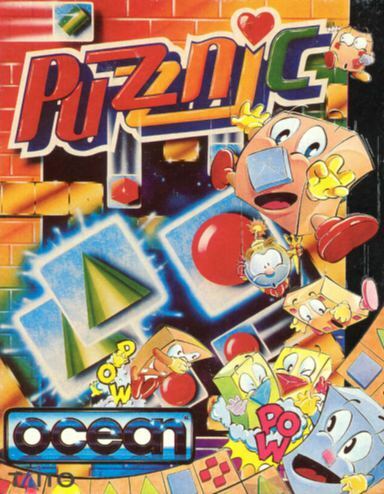 Blubarju: "A very good puzzle game, but I like Th!nk Cross better due to the smoother controls. In Puzznic, the controls unfortunately, do not react that quickly. Therefore only 7 points from me." Puzznic in the Killer List Of Videogames.